The compilation will include Dragon Age RPG sets 1 through 3. A combined edition of Green Ronin Publishing's Dragon Age RPG is on the way later this year, compiling the rules for levels 1-20 of the tabletop roleplaying game into one central rulebook. This release will come shortly after the release of Boxed Set 3 (Levels 11-20) for Dragon Age in August, and the release video game Dragon Age: Inquisition in October. The compiled book, called Dragon Age: Ultimate Edition, will have the core rules from all three sets of the game in one place. Unlike those boxed sets, though, it won't include precisely the same adventures and maps, and no dice. Most notably, the products released so far have always assumed you're playing during the Fifth Blight - the time shown in Dragon Age Origins - but the Ultimate Edition will include "a number of campaign frameworks to choose from." The Ultimate Edition will also include a new starting adventure for players of the game, replacing the old module. 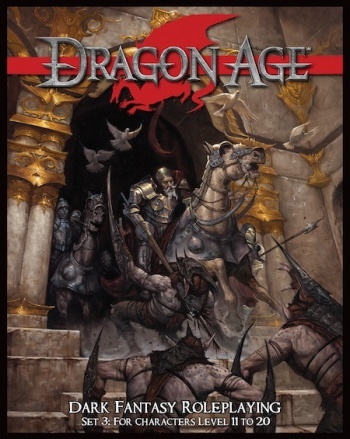 The Dragon Age RPG had always been touted as a collection of three boxed sets, but long time fans shouldn't be surprised by the announcement. What is surprising is that the release comes so quickly on the back of the delayed Set 3 release. Because of the Ultimate Edition, Set 3 of the RPG will be a limited print run - so act quickly on those pre-orders if you're interested.